Rev. Sarah is from Marysville, Ohio. She graduated from Muskingum College (now Muskingum University) of New Concord Ohio with her Bachelors of Arts. Majoring in Political Science and Christian Education, she graduated in 2005. Rev. Sarah received her Masters of Divinity from Louisville Presbyterian Theological Seminary in Louisville, KY in 2008. Her first three years of church service was as a Director of Christian Education at First Presbyterian Church of Frankfort, KY. Rev. Sarah was then called to to South Bend, IN for her first ordained call in 2013. 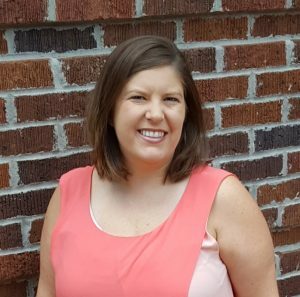 She served as Associate Pastor of Christian Formation and Education at First Presbyterian Church of Downtown South Bend, IN till the summer of 2018. On July 8th, 2018 Rev. Sarah was installed at Associate Pastor for Christian Education and Family Ministries here at First Presbyterian Church of Winter Haven by the Presbytery of Tampa Bay. Rev. Sarah is active in Christian Educational ministries at our church, serving in leadership at the national level with the Association of Presbyterian Church Educators (APCE Treasurer 2017-2020), the presbytery and national PC (USA) such as a General Assembly Teaching Elder delegate to the 222nd GA. When not active in ministry with our church, you can find Rev. Sarah walking her dog, Sammie; perusing the historical fiction books at the library, playing soccer or enjoying all the water sports that Central Florida has to offer.